Catholics are supposed to be the champions of human rights. We are 25 percent of the U.S. population, yet Barack Obama was twice elected president and he wages numerous kinds of war both here and abroad. As Congress weighs Obama’s plan to bomb the Syrian people, Catholics and all Americans need to understand what’s at stake and urge their members of Congress to vote against it. Stephen Coughlin, a senior fellow at the Center for Security Policy, is Catholic and an expert who educates members of Congress and the Defense Department on Islamist terrorism. Coughlin was referring to my previous story with him on the Muslim Brotherhood’s own memo explaining its current “grand Jihad” to take over America by “eliminating and destroying the Western civilization from within and ‘sabotaging’ its miserable house by their [own]hands.” Al-Qaeda gruesomely murdered thousands of Americans on September 11, 2001, the Muslim Brotherhood has infiltrated the U.S. government and it’s leading many of the revolutionary factions in Syria. Despite ample evidence of the grand jihad, many of our top officials who profess themselves Catholics are pushing for war on Syria. They include Vice President Joe Biden, Secretary of State John Kerry, Defense Secretary Chuck Hagel, House Speaker John Boehner and Minority Leader Nancy Pelosi. But do they have the courage to witness brutal truth? On June 23, in Gassanieh, Syria, an al-Qaeda sub-group, Jabhat al-Nusra or the al-Nusra Front, murdered Father François Murad. There are conflicting reports qbout how and where Father Murad was murdered, but not who murdered him. At first, various outlets featured a video by Jabhat al-Nusra, who videotaped themselves beheading two men with a butcher’s knife and the first victim resembles Father Murad. Nothing could have braced me for the violent evil in this video. It’s incomprehensible. I cried and prayed, but it haunts me. After both victims are killed, the jihadist mob cheers and proudly takes trophy photos of the victims’ severed heads. The clip stops short as other men are held captive on their knees, hands tied behind their backs, apparently awaiting the same execution. Father Pierbattista Pizzaballa, head of the Franciscan Custody of the Holy Land, told CNN that Father Murad was shot to death. 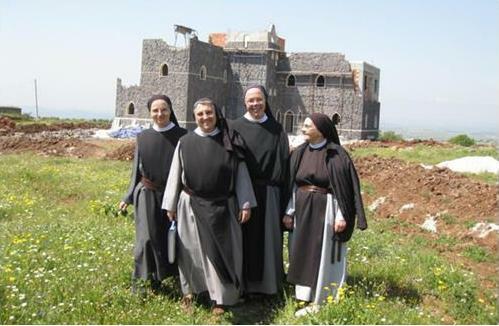 Citing official Church sources, the Vatican’s Agenzia Fides reported that Father Murad left his monastery after it was bombed and went to a Rosary Sisters convent to help protect the nuns and minister to a small remnant of Christians. According to the Franciscan Custody, they also cared for Sunni and Alawi Muslims. On July 2, Agenzia Fides quoted Farid, a Syrian Sunni Muslim activist, who decries jihadists. Farid said Jabhat al-Nusra is attempting to establish the most restrictive caliphate in history and “It is possible for beheadings to occur because for this ideology the infidel must be beheaded.” He said this means even non-compliant Muslims will be tortured and killed. Also on July 2, two Greek-Catholic priests told the Agenzia Fides about the tragedy of Mariam. She was a 15-year-old Christian from Qusair who was kidnapped, married to 15 jihadists – one after another – raped by each of them and then murdered. Like Father Murad, her captors were Jabhat al-Nusra, who had conquered her hometown and occupied it. The terrorists had ransacked and used St. Elias Church in Qusair as their residence and headquarters there, but the priests re-consecrated it to God and are collecting testimonies from survivors. In brief, the revolutionaries that Obama seeks to empower include several other jihadist groups. Therefore, Robert Reilly and Dr. William Kilpatrick, both Catholic specialists on Islam, warn against his agenda. Reilly wrote “The Closing of the Muslim Mind: How Intellectual Suicide Created the Modern Islamist” and is a former Defense Department official. “If President Obama is going to commit an act of war on behalf of one side in a Syrian civil war, he ought to be asked to explain why it is in the national security interests of the U.S. to take that side,” Reilly advised. “I have not heard a compelling reason yet. No amount of talk about chemical weapons can change the fact that this action engages us in a civil war on one side. What are the goals of the side we are taking and, if that side succeeds, how does its success serve our interests? “If we did not have a reason to intervene when the killing in Syria reached 100,000 casualties, why do we all of a sudden have a reason now that 1,000 more have been killed, by whomever, with a different kind of weapon? In other words, if they had died from regular artillery shells, would we be contemplating an act of war right now? The obvious answer is: No. The boldest critics against Obama are a small group of Trappist nuns in Azeir, Syria. Like many Catholic missionaries, these nuns minister to Christians, Muslims and everyone in their path. On August 29 they wrote an open letter, which was reprinted from Avvenire byThe Catholic World Report. The nuns said their townspeople anxiously watch TV for news that Obama has ordered attacks. “Will the Nobel Peace Prize winner drop his sentence of war onto us? Despite all justice, all common sense, all mercy, all humility, all wisdom? Indeed, Patriarch Gregory III of Antioch, who oversees the Melkite Greek-Catholic Church in Syria and Lebanon, protested President Obama and his administration. On August 28, he told Asia News: “This attack being planned by the United States is a criminal act, which will only reap more victims, in addition to the tens of thousands of these two years of war. This will destroy the Arab world’s trust in the West. Pope Francis, grieved by the war, sufferings and deaths in Syria, has called on all Catholics to pray and fast for peace. Pope Francis couldn’t be more clear. Catholics and all Americans should forcefully cry out against Obama’s plan to bomb Syria. Previous ArticleWhat are You Giving Your Mother Mary for her Birthday? Pope Francis Instead of praying for Muslims in Syria who are heretics, we should be praying for Christians throughout the world. Sept. 8th: Pope Francis is not praying for Muslims in Syria and if you followed his words and his actions you would see that he is praying and working for peace among all peoples throughout the world…you should follow his example! This is a significant article. The problems in Syria are huge. One knows that over two million refugees have left the country recently and that the forces of Basher al- Assad have been responsible for a huge number of killings, including the use of lethal gas on a large scale. From a humanitarian point of view intervening to prevent these atrocities sounds attractive, but if Assad falls Syria will be a colder and more dangerous place for Christians. Thus I agree with this article, even though I would like more evidence that “the Muslim Brotherhood has infiltrated the U.S. government”. The Pope today at his Sunday Angelus address said “I invite you to keep on praying so that the violence and devastation in Syria stops (sic) and so that people work with renewed commitment for a just solution to this fratricidal conflict”. We should support him fully in this.